We are riding a quint to travel the 7,000 miles to Alaska. It is especially designed to fit our family. With the use of couplers it can be reduced from a quint to a quad, triplet or tandem. This will provide us with flexibility on the trip, whether it is for shopping or for transporting the bicycle on a ferry. Both Cheyenne and Jasmine can ride their bikes very well. But of course they are way to small to go all the way to Alaska on their own bikes. They do enjoy pedaling a bike, so we looked into tandem bicycles. Looking at tandem bicycles on the web showed us that even little ones like Robin can ride. With the help of a stoker kit - a T-off from the main chain, reaching up to a crank set the child can reach, connected with an additional chain - Robin can become part of the pedaling experience. 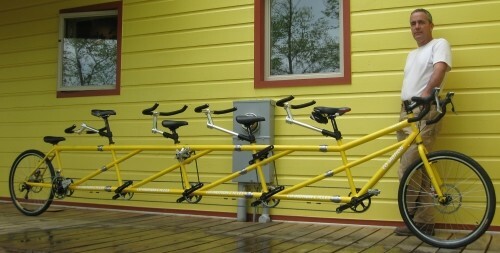 We knew there were triplets - bicycles built for three. Yet, to go with a triplet and a tandem bicycle, we still had the 'problem' of one bicycle team keeping up with the other. The funny thing with online research is that you keep on clicking. One story leads to another. A triplet led us to a quint. Our first encounter with a quint. This has opened up a totally new horizon for us. We will all go at the same speed and all three girls will be able to pedal. 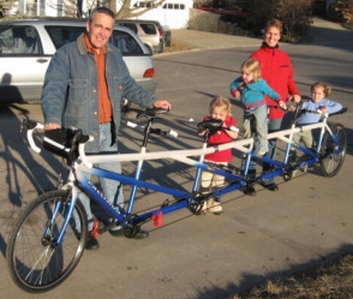 Most of our information about tandem bicycles came from Mark of Precision Tandems in Kansas City, Kansas. We contracted with him to build our quint. The frame is build by Co-Motion in Eugene, Oregon. You don't have to go through a middle person, but we did. It was the best thing we could have done. We don't have enough knowledge ourselves to figure out the exact measurements that are needed for a perfect fitting bicycle. Neither have we been avid bikers who know about the gear to put on it. Our quint bicycle arrived in May. Now that we have the bike, we can start training for the journey.